Pond Lining | Newport & Cardiff | Pond Lining South Wales. Glass fibre (GRP) is perfect for Koi Carp ponds and pool lining. It provides a smooth, hard wearing surface which is watertight and easy to clean. 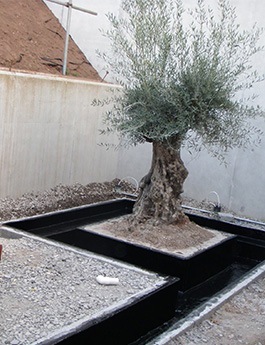 Unlike most lining systems, fibreglass can be moulded around any shape and can be any size, so you can design your pond exactly as you want it. We can apply our GRP to most surfaces, but the preferred surface is a concrete block structure with a cement render. This build makes your pond smooth, great to look at and more importantly, great for your fish. On most applications we use a 2 layer of 450/sq mtr fibreglass mat system. This is applied rather like wall paper. First, if needed, we prime the pond and any pvc pipes/filters etc. We apply the first coat of resin to your pond wall, a layer of mat, more resin, then mat followed by the final coat of resin. This is then consolidated with a paddle roller and brush to make the surface smooth and of a uniform thickness. We continue like this until the entirety of your pond is covered. Once your pond has cured, we give it a sand down to make sure it's smooth. This also gives us the opportunity to thoroughly inspect every inch of the lining before we apply the final coating. Your final layer is the coloured flocoat. This can be any colour you choose, but for Koi Carp, dark green or black is recommended. This is not only soothing for the fish but helps reduce algae growth. All our materials are top quality and ordered directly from the manufacturer to ensure your Koi Carp remain in peak condition. The pond you are left with will last for over 20 years (even if your dog tends to take a paddle). 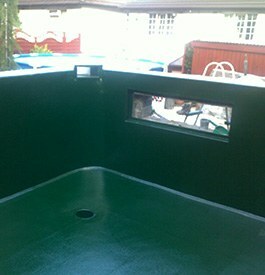 Unlike other pond lining, fibreglass will not puncture or deteriorate in the sun. 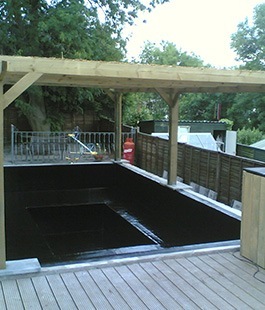 We do pond lining in areas such as Chepstow, Monmouth, Cardiff, Abergavenny, Brecon and Lydney; in fact, all of South Wales and the surrounding areas. 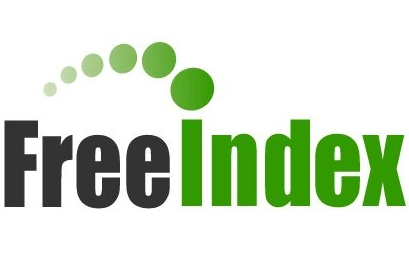 Please follow this link to see our reviews on Freeindex.